Geologists measure time in ‘periods’ and ‘eras’ lasting millions of years. Our current period is The Quaternary Period that began somewhat less than 2 million years ago. Beginning in the Paleozoic Era (544 to 245 million years ago) and ending sometime in the Mesozoic Era (245 to 65 million years ago), the land mass we call California was pushed up from the sea during which time there formed what ultimately became the gold fields and mines of California. California is a geologic highway accident where a string of vehicles reduce order to chaos. There is the likelihood of three island chains pranging the West Coast at different times. Each time, instead of being pushed aside by the mass of the North American Plate, they simply attached themselves like limpets. The extra pressure and mass pushed up the High Sierras and the Coast Range. This view of California’s disorganization is reinforced by the many directions faults take around the state. San Andreas, for all its fame, is not a fault, but a melange of fault structures, due to those impinging island arcs. Geologic time and human time intersect usually during great catastrophes such as volcanic eruptions, and when great discoveries are made from evidence found in the ancient earth. I am focusing here on the years 1848 and 1989, when these two events occurred: the discovery of gold in Sutter’s Creek and the “Loma Prieta” earthquake of 1989. 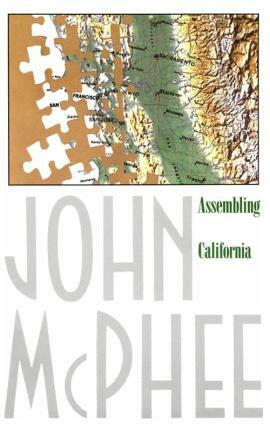 These two events are mentioned in John McPhee’s book, Assembling California, and in a subsequent discussion of the book in a recorded conversation on YouTube between the Pulitzer-prize winning McPhee and geologist Eldridge Moores, Professor emeritus at the University of California at Davis. The two men collaborated on the writing of the book. What brings me write about these things this is my recent hike in the Almaden Quicksilver County Park, located at the town of New Almaden, California, a rural part of greater San Jose. Without the vast amount of mercury that was mined and refined here, most of the gold ore dug out of California from the beginning of the Gold Rush in 1848 could not have been as easily and quickly processed into pure metal. Gold dissolves in mercury, forming amalgam alloys, but does not react with it. Gold is insoluble in nitric acid, which dissolves silver and base metals. This property is exploited in the gold refining technique known as “inquartation and parting”. (Source). In 1845, the Ohlone Indians brought a Mexican cavalry officer to the source of the red ore in the undulating hills of New Almaden. Seeing the possibilities in this cinnabar, the officer obtained title to the mineral deposit. This paved the way for what would soon become one of the most famous and productive mine in America. 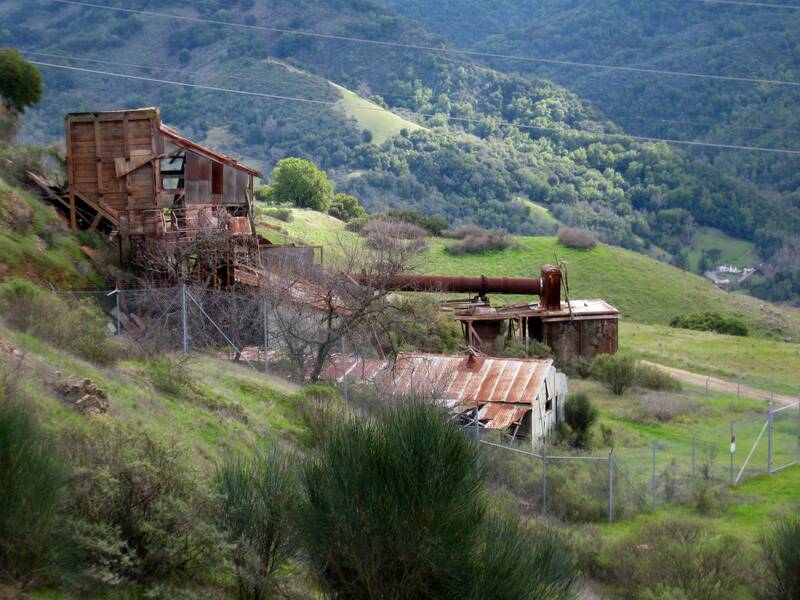 In its heydays, the Quicksilver Mine at New Almaden produced more than 220,000 pounds of quicksilver (mercury), making it the largest producer in the world and the most valuable single mine in California. Quicksilver proved to be a tremendous boon to the California Gold Rush since it could be used to separate gold from foreign matter. Inside the museum, we saw the huge cauldron that miners used to extract and distill mercury from cinnabar ore. My son learned how miners used candles to light their way through bat-infested underground tunnels and how they faced rattlesnakes and grizzly bears above ground. We saw old pictures of the once flourishing, turn-of-the-century town of New Almaden (the name Almaden came from a mining town in Spain by the same name). I walked the trail that takes one through the remains of “English Camp” a once flourishing town with a school and church. Old photograph of English Camp posted on site, along with historical information, showing the church on the right-hand slope of the ridge. The picture on the right (February 2010) shows the remains of the church. I have hiked many times in this park. My great-grandfather, Asbury Harpending, Jr., owned and managed a few California gold mines, so I feel a personal connection to this ridge of hills that was once full of mercury mines and refineries. 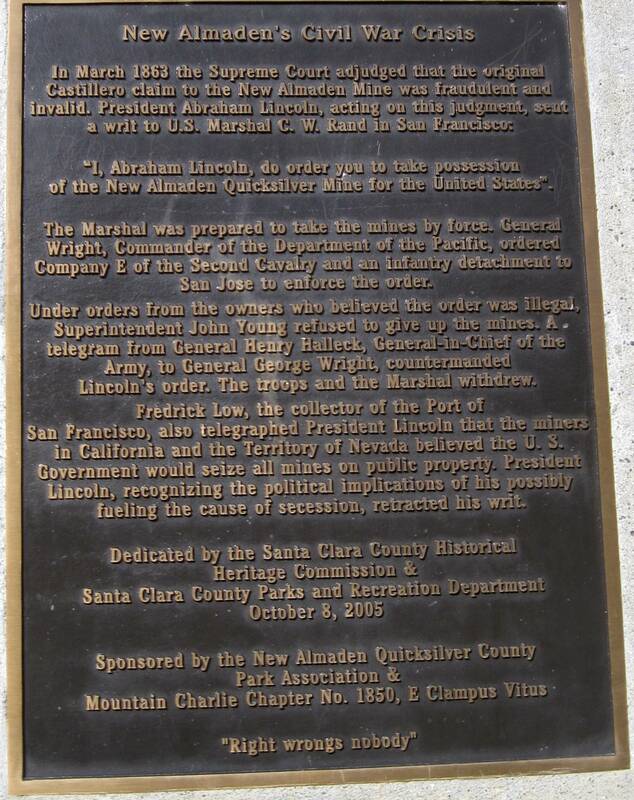 This entry was posted in Geography, Geology, Science & the Sciences and tagged Abraham Lincoln, Almaden Quicksilver County Park, Assembling California, “Loma Prieta” earthquake of 1989 California, California Gold Rush, Eldridge Moores, John McPhee, New Almaden, Ohlone Indians, San Andreas fault. Bookmark the permalink.